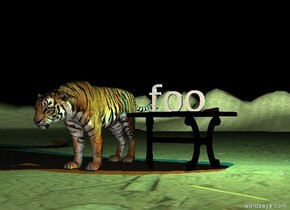 the "foo" is on the table. a large tiger is next to the table. it is cloudy. the table is on the very tall dirt mountain range. the cyan light and orange light are three inches above the "foo". they are to the right of the table. it is night. there is a shiny door. the door is on the grass mountain range. the mountain range is very tall. a blue light is 3 feet above the door. a black house is 30 feet left of the door. the house is facing right. it is cloudy. a very enormous klimt head is 15 feet behind the door. the door is facing right. 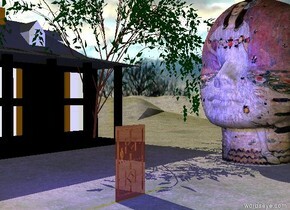 the willow tree is left of the head. 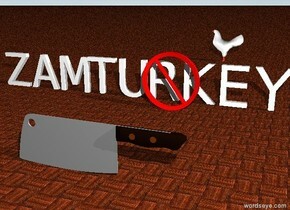 the "ZAM" is to the left of the "TURKEY". the red not sign is 1 foot in front of the "TURKEY". the huge knife is 5 feet in front of the not sign. the ground is tile. it is morning. the sky is cloudy. the chicken is 10 feet behind the "TURKEY". it is facing left. the guillotine is on the enormous wood cube. 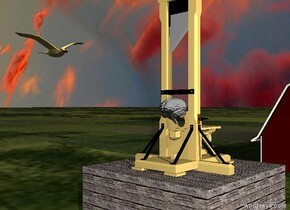 the large brain is -3 foot in front of the guillotine. the brain is 3 feet above the cube. it is cloudy. 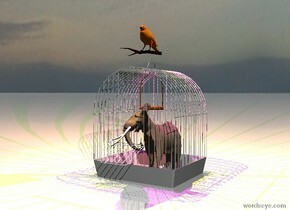 the huge bird is 9 feet to the left of the cube. it is 19 feet above the grass ground. it is facing the cube. the barn is 45 feet behind the cube. it is morning. The tiny "a" is 2 inches to the left of tiny "e". the small eye cube is 2 inches to the right of "e". the tiny "o" is 2 inches to the right of the eye cube. the very tiny woman is to the right of the "o". the ground is wood. the tiny [stage] wall is 1 foot behind the cube. the red light is 6 inches above the cube. the blue light is 6 inches to the right of the red light.